Distribution : Indian Ocean. 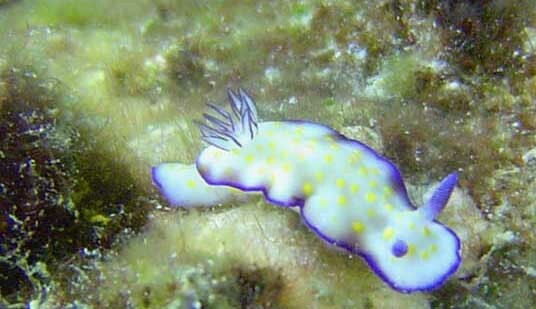 Relatively common in Red Sea and East Africa. The mantle is white or creamy white with numerous small yellow orange spots. The edge of the mantle has a thin band of light bluish purple and there are a serie of irregular purple patches around the edge. The gills are often branched and wave rhythmically from side to side. The underside of the mantle is white with yellow orange spots and there is a light purple border somewhat wider than dorsally and of irregular width. 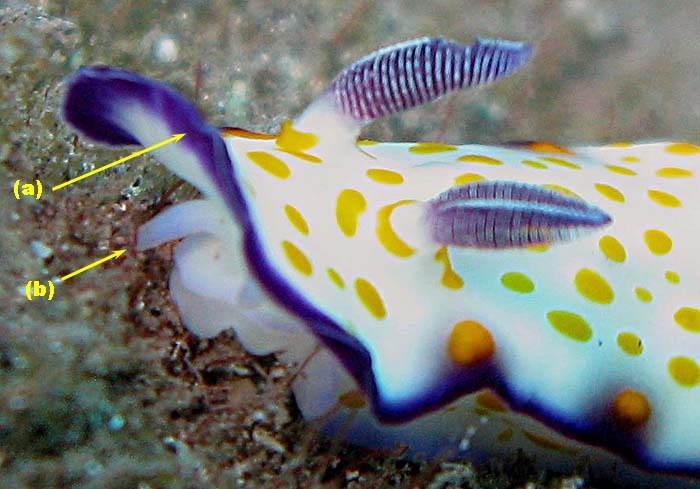 The sides of the body and the foot are white with yellow-orange spots and the foot has a light bluish purple border. 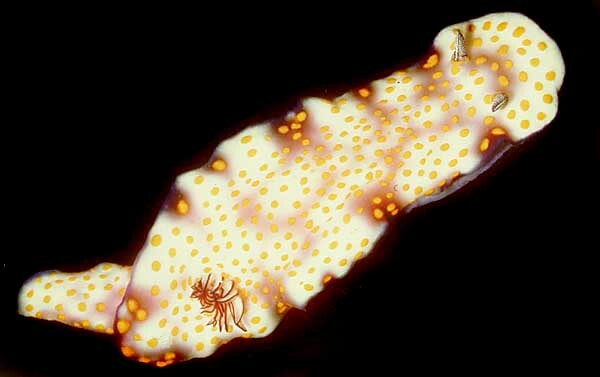 There are traces of the pale watery reticulate pattern on the dorsal posterior part of the foot. When recently spawned, the egg ribbon is reddish orange and it is attached along one edge in a spiral, the free edge being slightly wavy. The characteristic trailing behaviour, where pairs of animals are often found following each other in single file, the second animal in the line usually touching the 'tail' of the one in front. 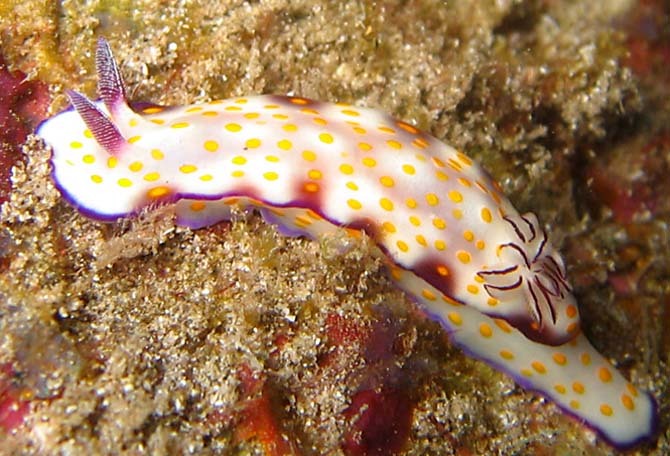 In the western Pacific there is another species, Hypselodoris imperialis, which differs externally in the absence of the purple border to the foot and the smudged purple reticulate pattern found on the dorsum, and another difference is that Hypselodoris imperialis is creamy white with a dark blue mantle border. 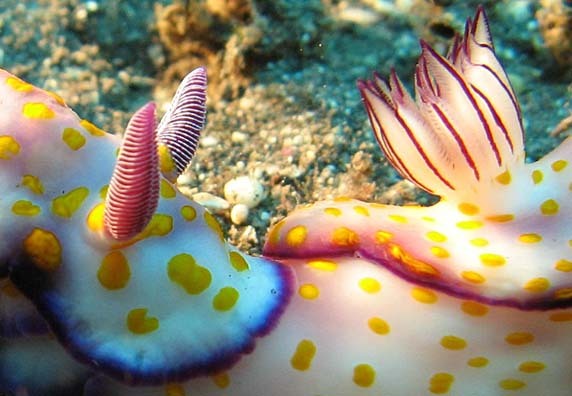 Originally described from the Red Sea, where it coexists with the similarly coloured Hypselodoris ghardaqana and Goniobranchus annulatus. Reunion, Saint Gilles near "tour de Boucan-Canot"
The characteristic trailing, where pairs of animals are often found following each other in single file, the second animal in the line usually touching the 'tail' of the one in front. Reunion, Cap la Houssaye, Saint Paul, 10 m, 4 April 2009, size : 40 mm. 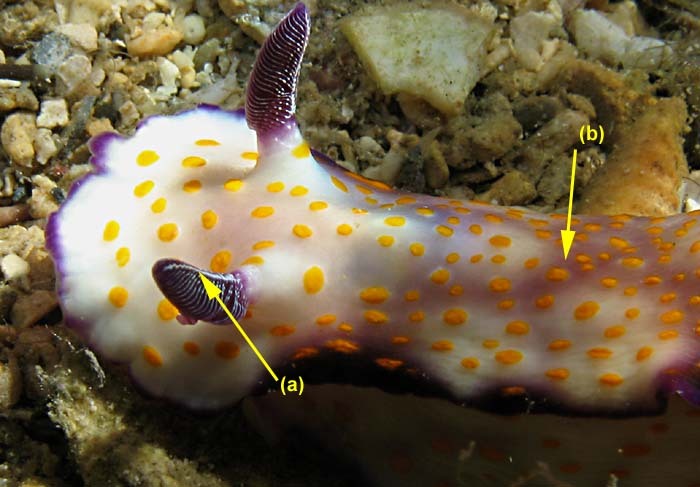 (a) The underside of the mantle is white with yellow orange spots and there is a light purple border somewhat wider than dorsally and of irregular width.